Step 1: Insert a High Purity SR+ Card into the base card slot. Only a High Purity SR+ Card can be transformed into an Ultimate Card. Step 2: Press the "Ultimised" button (アルティメット化する）. No need to put any type of card in the material card slot, just press the button. Step 3: A screen will pop up, informing you on the type of Ultimate Gems needed to transform your High Purity Card. Click the left red button to confirm. *An Ultimate Card gains an additional Skill slot, so there are 4 permanent slots now. 3 types of Ultimate Gems are required to "Ultimise" a High Purity SR+ Card. An Upright Power Card will require a Rainbow, Solar, and Sword Gem. A Reverse Magic Card will require a Rainbow, Lunar, and Mystic Gem. An Assist Card will require a Rainbow, and 2 Beautiful Gems. Step 1: Place your Ultimate Card in the base slot. *1: You can use a SR+ Card, High Purity SR+ Card, or Ultimate SR+ Card as material. *2: If using a Fairy Godmother to boost the Ultimate Card, set it in the material slot and press the middle top red button "合成する". 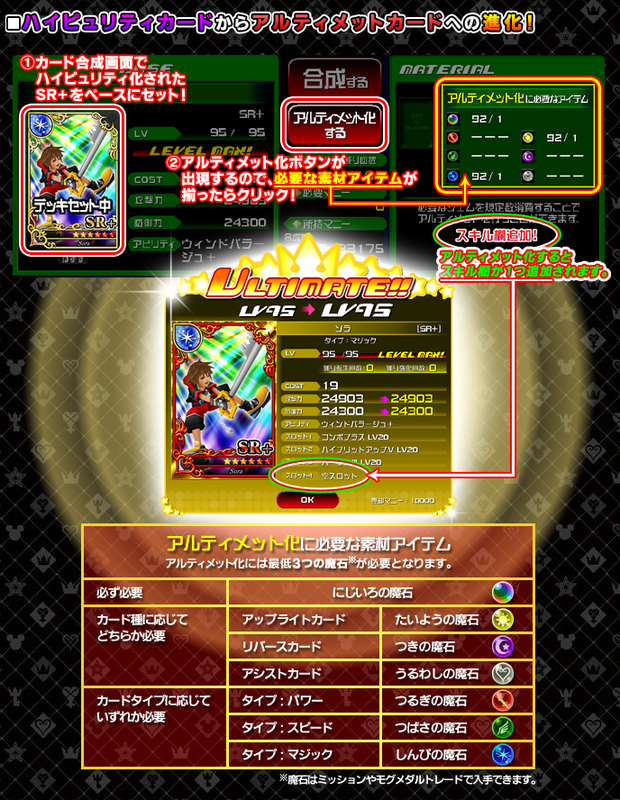 *3: At rare times, you will receive items when strengthening Ultimate Cards. Power Up!! gives a 1% transfer. Excellent Power Up!! gives a 2.5% transfer. Wonderful Power Up!! gives a 3.5% transfer. Note 1: Using a High Purity SR+ Card or Ultimate Card as material guarantees an Excellent or Wonderful Power Up!! Note 2: An Ultimate Card can only be strengthened up to a maximum of 5 times. Upon reaching the maximum amount of times you can strengthen your Ultimate card, the "強化する" button will be replaced with "転生する"
Step 1: Place your fully strengthened Ultimate Card in the base slot. Step 2: Click the middle bottom red button "転生する" to reincarnate the card. Reincarnation requires double the amount needed to "Ultimised" a card, ie. a total of 6 gems. Step 3: A screen will pop up informing you on the amount of Gems needed to reincarnate. Click the left red button to confirm. From this new state, you can continue to strengthen your Ultimate Card once again for a maximum of 10 times this time. 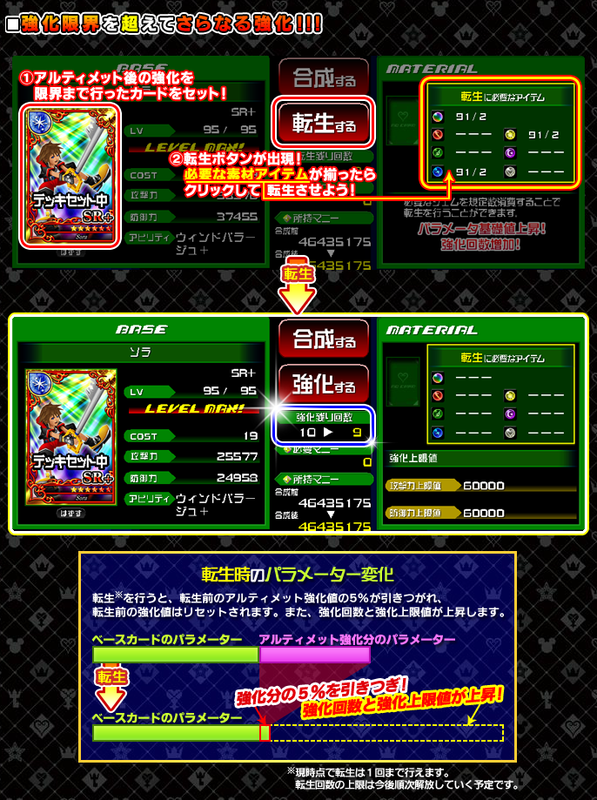 The maximum stats of an Attack and Assist card after the first reincarnation is 60000/60000 and 60000/600% respectively. As of 25th December, you are able to reincarnate your Ultimate Cards up to 2 times. The amount of gems required is 3 x the number needed to "Ultimise" your card. The transferred stats after the 2nd Reincarnation follows this formula: Incremental Stats after first Reincarnation x 15% x Boost Rate. After the 2nd Reincarnation, you can strengthen your Ultimate Card up to 12 times. And the maximum stats will be increased to 70000/70000 and 70000/700%. Through the Remembrance Gem, you are now able to reset your Ultimate Card back to its initial state. Step 1) There is now a 3rd red button, "リセットする" in your Card Synthesis screen when you have place an Ultimate Card into the base card slot. Step 2) Clicking that button will bring you to a confirmation screen where you can click the left red button to proceed. Step 3) After the reset, ULT Attack or Assist Moogles (depending on which card you reset) will be delivered into your Present Box. You will receive 1 x ULT Moogle for each material card you have used on your Ultimate Card before the reset. Note 1: You will not get back any Ultimate Gems used prior to the reset. Note 2: Any SR+ cards can be used as strengthening materials. You will still receive 1 ULT Moogle. The purpose of this special Moogle Card is for strengthening Ultimate Cards, ie. a replacement for a SR+ Card, High Purity SR+ Card, or Ultimate SR+ Card as material. 1) This card cannot be equipped, it has a deck cost of 999. 2) It can reach High Purity status through Yen Sids, reaching a status of 100001/100001 for Attack and 110001/759% for Assist. 3) It can be boosted by Fairy Godmothers. 4) It can be "Ultimised" and Reincarnated as well. BUT never do this! There is no effect on its stats even if you do so. This card is extremely useful, with a Wonderful Power Up!! 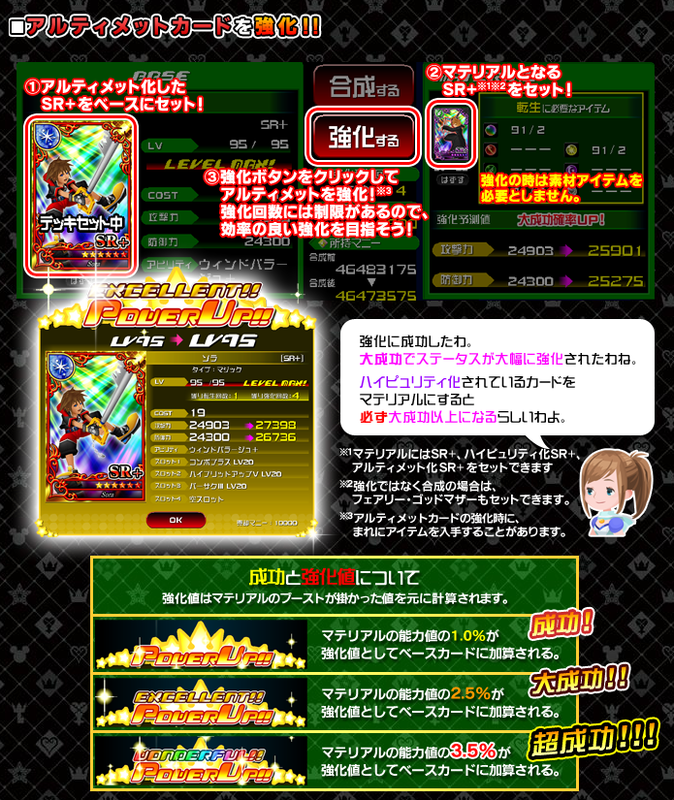 and boost by SR+ Fairy Godmother, it can increase your Ultimate Card's stats by 10500/10500 or 11550/80%! To obtain a maximum stat of 60000/60000, the most efficient way is to use 5 fodder cards and Reincarnate, then use 7 x SR FGM boosted HP ULT Attack Moogles. To obtain a maximum stat of 70000/70000, the most efficient way is to use 5 fodder cards and Reincarnate, another 10 fodder cards and Reincarnate again, then use 9 x SR FGM boosted HP ULT Attack Moogles. 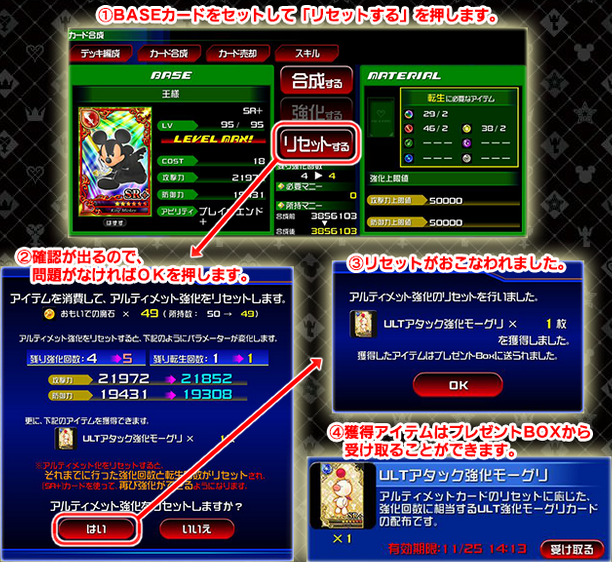 And if your base card has less than 25000/25000, use the above information to minimize the amount of cards needed. To make your 60000/60000 card into 70000/70000, you will need to use 7 x SR FGM boosted HP ULT Attack Moogles after the 2nd Reincarnation. Note that when you are maximizing your Assist Cards, your HP will be maxed out way earlier than the LUX%. HP will be maxed with just 5-6 fusions, while LUX% will most probably need up to 10 fusions. So make sure to always use LUX oriented cards, it is very costly and highly impossible to maximize the stats of a HP oriented card. To obtain a maximum stat of 60000/600%, the most efficient method is to use 5 fodder cards and Reincarnate, then use 7 x SR[SUP]+[/SUP] FGM boosted HP ULT Assist Moogles or (2 x SR[SUP]+[/SUP] FGM & 8 x SR FGM) boosted HP ULT Assist Moogles. To obtain a maximum stat of 70000/700%, the most efficient way is to use 5 fodder cards and Reincarnate, another 10 fodder cards and Reincarnate again, then use 9 x SR[SUP]+[/SUP] FGM boosted HP ULT Assist Moogles. To make your 60000/600% card into 70000/700%, you will needto use7 x SR[SUP]+[/SUP] FGM boosted HP ULT Assist Moogles after the 2nd Reincarnation. but i don't understand, when you get Excellent and Wonderful Power Up? Yes, the chances are random. However, if you use a HPed SR+ card as a material, you're guaranteed an "Excellent!". Oh yeah overlooked the speech bubble. Well the first post is mainly the full translation of the information they gave us. Any new information discovered will be added on accordingly. Thanks guys. This is really helpfull! There's something I don't quite understand: we get an ultimate card, we fuse 5 SR+ with it, then we have to reincarnate it to further strengthen it, right? And after the "reincarnation" we get to fuse 10 more SR+. So, when we reincarnate a card all the stats added with the first 5 cards are gone? It appears that at least a portion gets added to the base stats of the ultimate card as a "remnant" of the power it had before it was reincarnated. Anyway you totally rock Kazr! This is quite helpful and makes it much easier to get. We create an Ultimate card. We fuse SR+ cards to it. Obviously, the stronger the material, the more stats are transferred. So best case is HP SR+ with x2~x5 boost. This is like limit cutting, maximum is 10. Just that in this case there is no extra boost for maximum strengthening a card. To option to reincarnate the ultimate card will only appear upon fully strenghtening it, ie. 10 "limit cuts". As for reincarnating itself, the term is accurate. Because you literally start anew. If your base ultimate card is 10000/10000, maximum strengthens at 15000/15000. Reincarnating it resets it back to 10000/10000 plus 5% of 15000/15000. And it is said the transferable stats is increased, but who knows by how much. I like the color of the border a lot (on the up right cards). This card has been fully strengthened once again after being reincarnated. Assuming the material cards used are of equal or weaker strength than this Key Art, then the maximum power increment would be 135%. That is around 34500/34500. The strength of the card as seen is 41785. Which is actually a 152% increase, as compared to 135% before reincarnation. When reincarnating, does it take 5% from the new base stats or the total including any boosts? 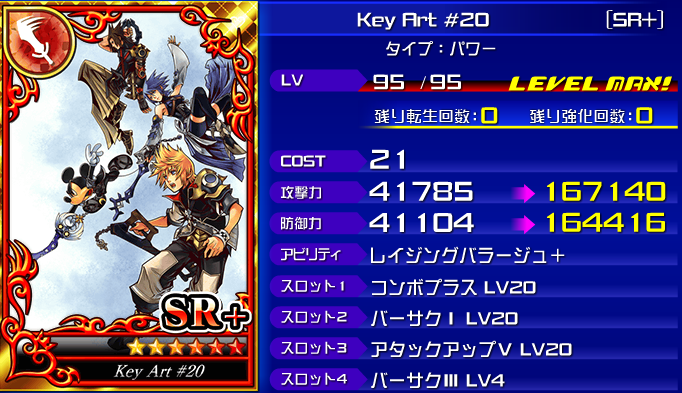 Example: Cloud & Tifa SR+ Power, base stats 26795/26795 x 3. So the new stats are 36795/36795 x 3 = 110385. So then we reincarnate it, does it take 5% from 36795, or 110385? Cause if that's the former that's only about 1840, otherwise that's 5519. Then you can chuck another 10000 (at least), which I suppose gets us roughly the example you have above with Key Art #20? I guess the next big question is what to do with them once they're all maxed out. I noticed that assuming you can use ultimate cards as fuel, given an infinitely amount of cards and items, you could make any card insanely powerful. Though I think Assist cards are maxed at 50000 HP and 500% LUX before boosts. Oh yeah, a strategy for boosted SR+ cards can now be, the day before the boost ends, use it as ultimate fuel! So does this look about right? Note: This process assumes you get 3.5% of the stats for each fusion, will most likely not turn out that way. Also, fusing stronger boosted cards then Oogie x2 SR+ will give you better results. If you use higher boosted cards as fusion cards, you could maybe get up to 50000, but there's a lot of ifs in there. I probably should've done a test using all fused cards at 2.5% as well. Still need to know if reincarnating counts the boost. I've taken a glimpse through your calculations and theoretically, that should be correct barring unknown variables. If you would just take your time, the concept behind it is actually pretty simple although the cost involved for that ideal case (all 3.5%, 2x boosted) is really hefty. Also, I think Tig's idea of feeding boosted cards to Ultimate cards right before their boosts expire is a good idea, especially if without boost they are weaker than our 9 strongest SR+ cards of the respective types. If we have HPed weaker "revived" cards from the revival campaign, we can use them to fuel Ultimate synthesis on 9 October before maintenance. That way we'll be making the best use of theor boosts as well by transferring a part of them to our Ultimate card in the growth. Yeah. I did start doing calcs for a scenario assuming all the fusions were at 2.5% but then I saw all the different possible outcomes and was just like there's no point to this. There's just way too many variables to this to make a "one-size fits all" scenario. I used Oogie mostly just cause I have two sitting in my deck I can't wait to get rid of and wanted to wrap my head around the whole thing. And that is a good point as well, regarding using up boosted cards. If you can, people should try to stick to the cards that are part of the revival campaign for fusing, cause you never know they might boost some other cards later on and it would be unfortunate if you had already fused them all. They've already said they're planning to boost some old Assist cards and Key Art cards too. Yeah. I have many cards that are rebooted this week, which means that I won't be so lucky in the coming ones. So putting off till 9th Oct before attempting this system myself. Point to note though this revival campaign seems to be a yearly thing. But I personally don't see a point in keeping them for that. The boost on the Ultimate Card will then expire too right? (like after a week) Or will it stay there forever? Feeding an Ultimate Card a boosted SR+ doesn't give the Ultimate Card a boost as well. The reason for using boosted SR+ when fusing is because the percentage comes out of the boosted total stats, not the base stats. So you can get more stats then you would just fusing an unboosted SR+. Any boosts that exist on any Ultimate Cards (FGM, or event) would expire as they normally do. I see, thx. So does that mean the boost stays then for another week (if it was a FGM)?